Plant bulbs this fall for carefree flowers next spring. I sometimes think a whole garden could be constructed using only bulbs, but I have yet to explore that idea. My favorites are daffodils & narcissus (Just to make things difficult, daffodils are narcissus, too.) They are not only cheery in spring, they are carefree, only needing digging and replanting when they become too crowded to bloom: Free bulbs and more flowers are the result. Since daffodil bulbs are poisonous, squirrels and other critters do not dig them up and deer avoid the flowers and foliage. Usually, the easiest daffodil bulb to find is the old yellow large cup King Alfred. It is still a beauty in the garden. 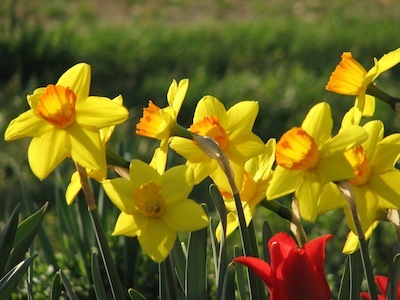 If you shop from bulb specialists, you can find daffs in differing size flowers, from petite to large cups and in white, yellow, pink, and orange or combinations of these colors. Since daffodils require just a bit of chilling they will grow and thrive anywhere in the country where there is some semblance of winter. If you live in a warm climate, search out cultivars that do well in your area. Plant daffodil bulbs in full sun, that’s sun when the leaves are on the trees. If your bulb is 3 inches high, then the bottom of the bulb should rest six inches below ground (two times its height-if it is two inches high, then four inches deep). However, daffodil bulbs are not fussy about how deep they are planted. They often will move themselves to their proper depth within a year or so. 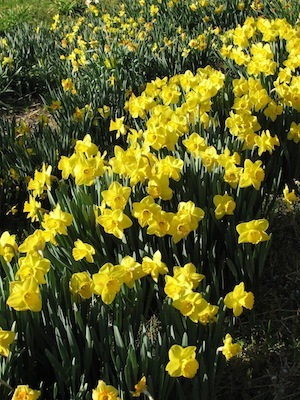 Daffodils will perform with only 6 hours of direct sun but you will get more blooms if they are not shaded at any time during their growing season. When the flowers are spent, resist the urge to cut off the foliage. If you remove the foliage while it is green, you will starve the bulb. Once the green leaves turn yellow or brown, you can tidy up by removing them, but not before. There are several types of bulb planters out there, and along with a garden trowel, they all do the job. My favorite, because it is almost labor-free, is the bulb auger that fits on the end of an electric drill. You can make short work of planting bulbs with this. It is also useful for planting pansies and violas or any other bedding plant. Zip-zip-zip and you have planting holes dug just that quick(ly).